Western Pond Turtle, average sized specie usually found along the west coast of Mexico and USA is specie nearing its extinction. 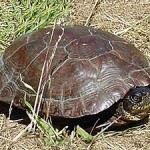 So much so, that Pacific Pond turtle or Western Pond Turtle is being declared extinct in Canada. These species do not like to involve in the human community. If they sense any kind of sound they quickly hop in to the water. The turtles shape indicates their exposure to the water. These species is the only one that belongs to the category of Actinemys genus. They are serene but when in danger, they can produce a pretty shrill sound. As compared to other turtles, they are cool tempered. 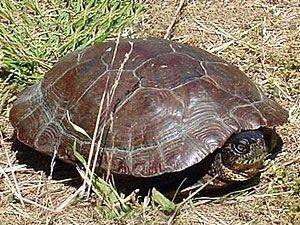 The color of western pond turtle ranges between dark brown or olive. 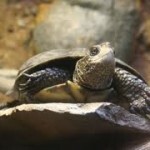 The size of their shell is ranges within 4.5 – 8.25 inches. The dorsal carapace portion might or might not have networks. However, they possess some lines on their shell. These shells appear to be very glossy in the elder ones while the lower portion of the shell is yellowish in color. In addition to this, their tails and heads also follow the same yellow colored pattern. Naturally, they are grey in color covered with scales all over their body. In case of males, these species have yellow colored throat. The males also possess a long tail and the cloaca is situated at the end of the shell. In case of the females, the cloacae are not at the end of the shell. They inhabit the coast of the western parts of Mexico and USA. They also dwell along wet areas from Washington to California. 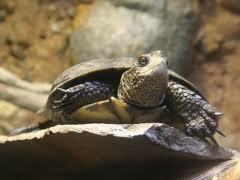 The turtle mostly like to dwell in calm and quiet ponds, marshes and pools. These species like to be away from the water areas and live on the land surface close to water bodies. These species are omnivorous in their food habits. They like to nourish on plant roots, algae’s, lily etc. in plants and tadpoles, frogs, crayfish, and insects amongst animals. They always have their food below water. It is tough for them to have dry foods. During summer, these species always prefer to be active during the night. They sit on the rocks, logs and absorb the maximum amount of sunrays that can be available. This helps in maintaining a good body temperature. They are mostly found in water areas that are mostly shallow. These turtles tend to become very adamant while basking out in the sun. If they sense something uncanny, they have a tendency to hide behind the trees or leap in to the water. Otherwise they simply sit still by hiding their limbs. They tend to spend long time in quest of foods and draw oxygen from the skin. In hot summer days, when the sun scorched up the land they usually cling to the muddy areas. Whenever the atmosphere gets dry, they hardly move about. In such a scenario, they usually rest in the mud and take oxygen via their skin. This helps the turtles to live with less oxygen. They usually breed in the springtime and at the falls. These species attain sexual maturity when attain 10 – 15 years in age. The bigger turtles lay more eggs than the smaller ones. The females always move about 90 m from the vicinity of water areas in order to lay eggs. They wander to find some place to rest in. The best place should consist of dry vegetations. The females usually lay 5 – 13 eggs in each clutter. The size of their egg is 1 – 1.2 inches. The females always cover up the eggs with wet soil and vegetation to provide a wet environment. This method takes 2 to 4 hours. The eggs start hatching during fall. They usually live for up to 40 – 50 years. Sometime this life span may exceed 70 years of age. Presently, the lives of these species are at stake. Therefore, it is advisable not to go for petting them. Infact it is prohibited even by laws in certain states. 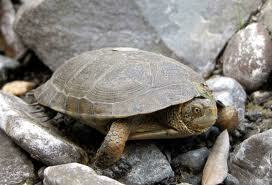 If any turtle is hurt then the individual who has found it should be quickly handover to the wildlife centers. Still if anyone wishes to pet these species and keep them in the cozy ambience of one’s home, they need to follow certain requisites. Conditions for Living: The tank needs to be of a minimum of 20 gallons capacity. The water area should have rocks, vegetation etc. There should be a provision of some artificial lighting and the temperature should range within 90 to 95-degree Fahrenheit. One should keep a constant check on the temperature with the help of the thermometer. It is also necessary to keep the water warm and use a heater if necessary. One should wash the tank regularly. Hydro sponge or under gravel should be used as method of filtration. 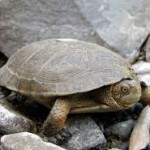 Foods for The Western Ponds Turtle: These species need calcium and vitamin supplements regularly. It is good to give provide them with variety of worms and crickets. Meat is also good for their heath. According to IUCN they are in the category of delicate species that may be threated to extinction if not taken proper care of.